Hey Guys, please take a moment to donate $1, $5, $10, or even more in supporting my Fiancée Dana and I raise money for our friend Brian's foundation! Dana is an elite Triathlete and will be joining Brian on the ride from New York City to Boston. I on the other hand am more of a rah rah supporter of my Fiancée's freakishly athletic accomplishments and will be part of the support team! Instead of losing a $5 Monday Night Football bet to your co-worker, save yourself the embarrassment and donate the money to a great cause! Like Intense Intestines on Facebook! 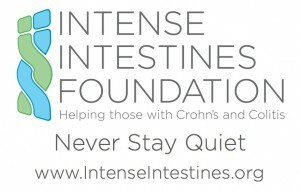 Follow Intense Intestines on Twitter! Are you or anyone close to you affected by IDB, PCS, Chron's or Cholitis? If so, share your story! Never Stay Quiet!